Bamboo is a member of the botanical tribe of Gramineae with over 70 genera of reputedly 1500 species whose woody stems called culms can have a mature size ranging from 100 mm to 36 metres with individual culms growing up to 30 cm in diameter. 2. How does it grow? Bamboo grows in a fashion that is quite different from the way that a tree develops. A tree has a layer of living tissue around the outside of it's trunk just beneath the bark. Left alone this layer of tissue adds an ever increasing circle of wood around the central mass which you can recognise as the concentric annual rings in cut timber. Not so bamboo. The bamboo stems emerge from the ground as buds with the same diameter as the final stem. All they do is grow longer in much the same way as a telescope, extending at a very rapid rate that can be in excess of a metre a day in a mature stand. When the culm is around three quarters to two thirds tall the elongation will tend to taper. However, they will remain the same diameter and possibly only grow another 10% taller as they mature over the next twelve months. When the culm has reached full height branches will start to appear and depending on species a new shoot can be fully developed within three months. During the shooting stage the new culm will be at least 85% water and it is imperative that sufficient water is supplied to fill these vertical liquid columns. If timber is to be harvested, there will be at least a three year wait for the water content to diminish, thus allowing the tensile strength to increase. As a natural and renewable resource bamboo offers Australia an opportunity to turn away from the destruction of our native forests towards managed commercial plantations that can be selectively harvested annually without the destruction of the grove or stand. Tree plantations obviously have to be chopped down and their nutrient arrest terminated at harvest. Bamboo keeps on keeping on, with edible shoots capable of extraction after less than five years. Timber is available after seven years, then just continuing on for decades or centuries into the future with minimum soil disturbance. The ability of bamboo to rapidly accumulate a high volume of tissue, or bio mass, has gained the attention of industrial and municipal engineers seeking to establish environmentally safe and reliable ways of taking up excess nutrients contained in waste waters from manufacturing, intensive livestock farming and sewerage plants. Trial plantations are expected to secure an advantage over other cropping systems. This is because of bamboo's inherently faster growth rate, massive size, and ever green all year round cover and the very important fact that bamboo can be harvested without the destruction of the grove or stand. 4. What is a Runner? A running bamboo is botanically classed as a "monopodial" species. 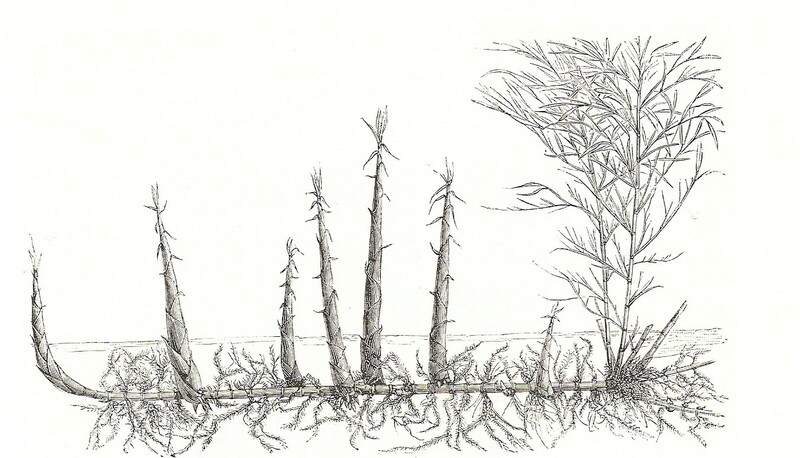 It is usually a temperate zone originator characterised by the development of an open network of horizontal underground stems called rhizomes, from which the new culms grow. This invasive habit has earned this group the name of "running" bamboo. The picture below displays the rhizome form which gives the bamboos belonging to the monopodial group it’s fantastic yield in commercial farming, and it’s mythical lack of controllability. 5. What is a Clumper? A clumping bamboo is botanically classed as a "sympodial" species. The larger of the species, usually originate in the tropics and the smaller clumpers prefer the cooler alpine regions. The new growth springs up from near the base of the mother plant to form, typically, isolated culms radiating from a centre and growing outward in all directions to form a circular mass of vegetation. 6. What is a Bamboo Shoot? It is the newly emerged culm that is cut and harvested as a vegetable. As a general rule, the base diameter will be around a third of the height. Once harvested it is cooked, sliced and added to Asian food dishes. It's surprising how many people have eaten bamboo shoots without even knowing. Once having tasted freshly grown and cooked bamboo shoot, you will never forget the unique taste and will be delighted with the sumptuous flavour that will vary from species to species. 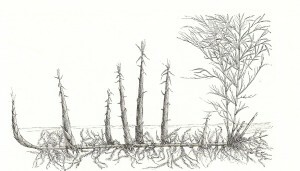 The quantity of new shoots and their size varies within a particular species, depending on soil and air temperature, the availability of water and especially upon the age of the plant itself. 7. Are all Bamboo Shoots Edible? Bamboo shoots are mostly edible and are very nutrient rich although the flavours can vary widely. 8. What is a Bamboo Pole? 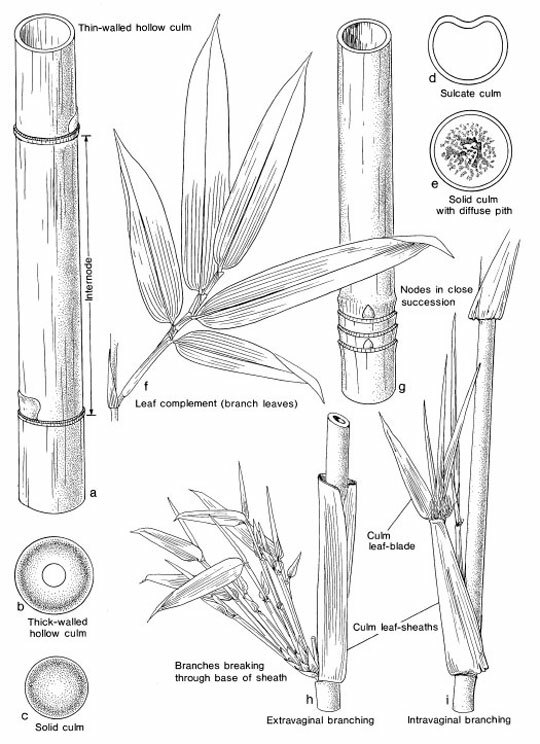 A bamboo pole is called a culm. It is the telescopic extension of the emerging shoot and grows to full height at a rapid rate that can exceed a metre a day. 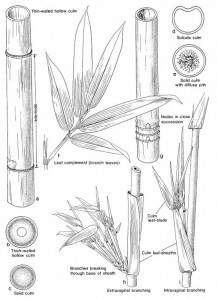 Perhaps the most noticeable characteristic of bamboo is the segmentation of the culm into distinct nodes or joints with intermediate smooth sectors called internodes. In the great majority of cases the culm internodes are hollow but in all cases the nodal junction is solid allowing for the transverse distribution of nutrients and water. The external surface is polished and extremely hard being coated with a protective screen of wax and silica. Peripheral culm tissue is a dense matrix of elongated cellulose plant fibres cemented together by a substance called lignin to provide a strong and very flexible pole. Poles have multitudes of uses but must be left in the grove or stand for at least 3 years before they are harvested for the timber. When harvested they are preferably stored vertically in the shade to dry. Young culms harvested and exposed to the sun will shrink and/or crack and are susceptible to borer attack. 9. What Species Do I Choose? This is where we open the can of worms on probably one of the most debated questions relating to bamboo. Australian bamboo nurseries now have a large range of sufficient quantities of running and clumping species to suit all buyers, whether they are collectors, landscapers, farmers, environmentalists or permaculture practitioners. At the outset you must determine your reason for wanting to grow bamboo and then run through a process of elimination to select a species that is adaptable to your climate, your pocket and give you the result you desire. Before a species is selected, the end use of the product must be determined. If a grower wants to grow primarily for timber, it is wise to select a species that has minimal branches. The cost of branch removal is a significant post-harvest expense and is best avoided. When the primary crop is shoot production, it pays to grow the species that will produce shoots that will meet the buyer criteria. It is financially prudent to grow a wide variety of species that can supply a continual shoot harvest over an extended period. Unfortunately this is not always possible due to regional climatic conditions. Considering the large range of species we stock and 25 years of experience, we can now offer our expertise in selecting a suitable species to suit most buyers requirements be it a back yard screen, broad acre plantation or commercial screening project. During the years a lot of myths and fallacies have evolved regarding the much maligned running species. Even a lot of the popular garden show hosts and propagators rubbish the runners. These myths are propounded, completely oblivious to the fact that the very species they are denigrating can yield huge volumes of timber poles and edible shoots when professionally managed in the rural environment. 10. Where can I buy quality plant stock? The most important point to remember is to check the credibility of the vendor. Whenever buying bamboo, ensure that the seller knows exactly what they are selling. Generally, the nursery trade knows virtually nothing about bamboo. At the moment for example, there are nurseries promoting "panda bamboo". It's isn't even a bamboo! Supermarkets are selling Dracaena sticks as “Lucky bamboo” whilst another common mistake confuses Lip Stick palms as a bamboo. It is really only the bamboo specialists who have experience, and the expertise to provide a fair idea of the growth habits of what they sell. The best rule of thumb is to only purchase bamboo from someone who can positively provide the botanical name of the species sought and also, make sure the plant has an ID tag attached. Another point to remember is the quality of the rootstock. I always make a point of choosing plants that have their roots protruding from the pot. If the roots are as thick as a matchstick then this is a good indication that there is sufficient root mass to support the plant. Discreet enquiries should be made to ascertain whether the plant may be reliant on chemical fertilisers. It is the policy of Bamboo Australia to use only natural fertilisers in the nursery and on the clumping species in the groves. Try to buy stock that has been raised on natural fertilisers such as the old favourites, blood & bone or any of the variants of dynamic lifter (pelletised chicken manure). Always be cautious of International seed vendors. It is a common practice to give one species many names to sell more seed. Remember the golden rule. Buy only from a specialist.